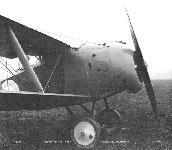 The Hippo was a two-seat fighter, very closely comparable with, and related to, its contemporary the Bulldog, and resembling that aircraft not only in having a new type of Clerget rotary engine with eleven cylinders (the Hippo having been designed with a view to replacing the 1 1/2 Strutter in French production) but also in the disposition of the crew. The Hippo differed essentially from the Bulldog, however, in having a backward, instead of positive, stagger; and this was a key feature in the company drawings that were approved on 30 April, 1917. As shown in those drawings the Hippo nevertheless differed from the first example seen in photographs in having plain, instead of balanced ailerons, and vertical tail surfaces with a full, rounded, typically ‘Sopwith' shape. A 200 hp Clerget 11Eb engine having arrived from France in September 1917, the first Hippo was completed (with French production in mind, as a private venture by virtue of Licence No.16 - and not to an official British Air Board contract) quickly enough to make its first flight on the 13th of the same month. The wing span being nearly 40 ft, and the ailerons of unbalanced type, lateral control was heavy; thus balanced ailerons were indicated (may, indeed, already have been schemed) and it could well have been the incorporation of these ailerons though alternatively some structural weakness - which led to the fitting of a new set of wings in December 1917, prior to trials at Martlesham Heath in January 1918. During early November 1917 the actual Clerget eleven-cylinder engine fitted for makers' trials at Brooklands had been taken from a Bulldog, and so far as is known no alternative installation of a Bentley B.R.2 (as once foreseen) was ever made. Between the Hippo and Bulldog airframes an interchange of Clerget engines appears to have occurred more than once, which is understandable because the 11E series was new and in demand, especially so as an output of about 250 hp was in prospect. Aircraft-performance was to be further improved by the fitting of an extra-large spinner, as designed by Clerget. That the number X11 was borne by the Hippo in the form wherein it was tested at Martlesham Heath during January 1918 is certain, and photographs show clearly that this same number was painted on the fuselage when a Hippo was photographed at Brooklands on 6 April, 1918. In the context of these same photographs the machine depicted is described as '2nd. m/c. ', although it obviously has plain ailerons and other differences which strongly suggest that '2nd form' might have been a more precise description, the number X11 having been allocated to the Hippo in two quite different states. At the same time, the possibility is recognised that the Hippo as first built may have been numbered X10 - a new set of wings (for example) being deemed to constitute a new machine. In any case, the first form of the Hippo set the general pattern for the type in having the pilot seated ahead of the top wing and the gunner stationed within (not behind) the wing, his field of view and of fire being enhanced by a trailing-edge cut-out - a double cut-out, in fact as illustrations show. But although the gunner was 'within' the top wing, he was nevertheless behind its rear spar, and was thus far removed from the pilot an arrangement which clearly led to difficulty in crew-communication, though it was adopted (jointly with the negative stagger) in the interests of view. Nevertheless, the pilot's forward field of vision was compromised by the bulky cowling which largely enclosed his two fixed synchronised Vickers guns - a compromise that was almost inevitable as the fixed armament was double that of the Bristol Fighter, and the forward cowling was shorter, though fatter. Further concerning the first form of the Hippo, this had a particularly heavy back-stagger of 2 ft 3 3/8 in (0.69 m) on its otherwise conventional wing cellule, the cut-away upper centre section whereof (though mounted directly on the fuselage) was braced to the top longerons by extremely short, and barely visible, vertical struts. Dihedral angle was a noticeable 3 degrees. Between the cockpits were a 30-gal (136 litre) main petrol tank, with pressure feed, and above it an 11-gal (50 litre) tank having gravity feed. The landing gear V struts were of wood. It may now be added that, whatever the facts of the matter, the Hippo now discussed was 290 lb (131 kg) overweight. 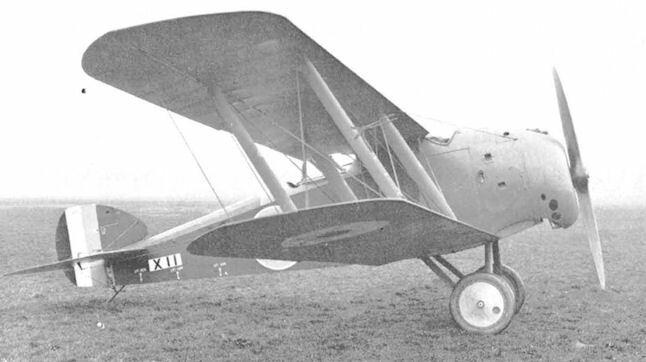 Although official British interest in the Hippo evaporated in February 1918, Sopwith themselves sustained development, and after X11 had returned from Martlesham Heath it was modified extensively. A landing gear of streamline-section steel tubing, and having larger wheels, was substituted for the former wooden gear; a Scarff ring-mounting and provision for eight 97-round ammunition drums for a single Lewis gun were installed for the gunner (the ring of the mounting being considerably greater in diameter than the fuselage width); the back-stagger was reduced to 1 ft 9 3/8 in (0.54 m); and perhaps most interesting of all - dihedral was not decreased, as might have been expected, but actually increased to 5 deg, though jointly with the fitting of new long-span plain ailerons. Fin area was increased by a fully-rounded outline, in continuance of the rudder top-line. More than this, there was yet another Hippo (or another 'experimental' number at least, associated with the airframe) - X18, the characteristics of which are not known but which was flying in June 1918. By that time, however, greater power than the Clerget 'E' could offer was not only in prospect but was clearly demanded, though the output of the nominally 200 hp Clerget (or Clerget-Blin) rotary was already being quoted as 225 hp, and even 260 hp had been mentioned by Sopwith themselves. But here the rotary type of engine was at a terminal point in its development. The short day of the radial Dragonfly was dawning; and the Bulldog was in any case the preferred new Sopwith two-seat fighter of a generally unsuccessful pair. Having drawn this present chapter towards a conclusion with particular reference to rotary engines, and especially those of Clerget type, a final note is called for concerning Clerget and Clerget-Blin. That the latter conjunction had early origins is attested by the fact that the Imperial War Museum once possessed a 200 hp water-cooled Clerget engine made by the Etablissements Malieet et Blin in 1911, and that Gwynns Ltd. of Hammersmith, London, held a licence from Clerget, Blin et Cie, of Levallois-Perret, for the air-cooled Type 7Z rotary. Span 38 ft 9 in (11.8 m); length 24 ft (7.3 m): wing area 340 sq ft (31.6 sq m). Empty weight 1.481 lb (671 kg); maximum weight 2,590 lb (1,175 kg). Maximum speed at 10,000 ft (3,050 m) 115.5 mph (186km/h); maximum speed at 15,000 ft (4.570 m) 101 mph (163 km/h): climb to 10.000 ft (3,050 m) 13 min 25 sec; ceiling 18,000 ft (5,480 m). N.B. The weight and performance figures quoted relate to the Hippo in its first form. It may be noted, however with the utmost caution that late in 1918 figures were issued for a Hippo to which a shorter span was imputed, this version having a reduced ceiling (as would be expected), a speed at sea level of 119 mph (192 km/h), and an endurance at 10,000 ft (3.050 m) - including climb - of 3 hr. Hippo. The Hippo two-seat fighter (1917) was a counterpart of the Salamander, in having backward stagger, and a contemporary of the Rhino, with which it was analogous in rear armament, the first machine being fitted with a pair of rocking-pillar mountings for two Lewis guns and the second having a Scarff ring-mounting for a single Lewis gun. The installation of the mounting was somewhat unusual, the ring being considerably greater in diameter than the width of the fuselage. The pilot had two Vickers guns in a remarkably neat installation and one which imperiled his frontal features less than in some other Sopwith types, the breech casings being located lower and further ahead. But although the familiar Sopwith padded windscreen was thus rendered unnecessary, the leading edge of the top centre-section was padded in the interests of head protection. There were separate case and link chutes low in the cowling and a small fitting, possibly for a sight, ahead of the windscreen. The gun gear was of Sopwith-Kauper type, and 500 rounds per gun were provided. The total ammunition weight of 260 lb, which has been recorded for the first Hippo, seems somewhat excessive, even if the four guns were included, for the guns themselves would weigh no more than 100 lb and the ammunition not much over 130 lb. Built as a private venture, the Hippo two-seat fighter featured negative wing stagger, the gap between the wings being completely filled by the deep fuselage, and the first of two prototypes was flown on 13 September 1917. A two-bay biplane powered by a 200 hp Clerget 11Eb 11-cylinder rotary, the Hippo had an armament of two fixed synchronised 0.303-in (7,7-mm) and (initially) two free-mounted guns of similar calibre, or (later) one 0.303-in (7,7-mm) gun on a Scarff mount in the rear cockpit. Official trials were performed at Martlesham Heath in January 1918, these having been delayed by engine problems. 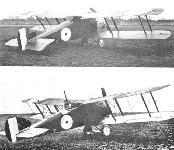 The performance of the Hippo was considered inferior to that of the Bristol F.2B and lateral control was criticised, and, on 2 February 1918, the aircraft was returned to Sopwith. Despite official rejection, the manufacturer fitted new wings, plain ailerons and an enlarged fin. 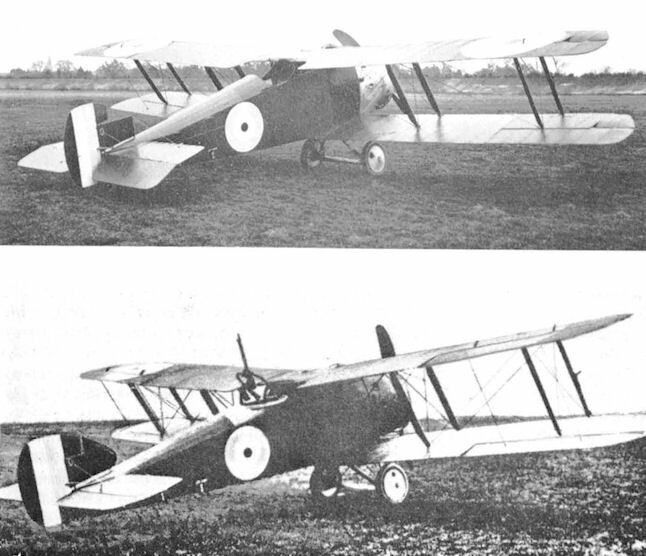 Wing dihedral was increased and stagger was reduced, and with these modifications the Hippo re-emerged in April 1918, with a second prototype following in June. By that time, the F.2B was giving satisfaction in service and it became apparent to Sopwith that the Hippo was too late, further development being discontinued. The following data relate to the Hippo in its original form. Max speed, 115 mph (185 km/h) at 10,000 ft (3050 m). Time to 10,000 ft (3 050 m), 13.25 min. Empty weight, 1,481 lb (672 kg). Loaded weight, 2,590 lb (1175 kg). Span, 38 ft 9 in (11,81 m). Length, 24 ft 6 in (7,47 m). Height, 9 ft 4 in (2,84 m). The first Hippo as later flown with dorsal gun fitted, added fin area and increased dihedral.